Get to know your director (which had already been done while we worked on the initial drafts of Meet You At the Manger). Be ready to listen to actors who may either ask questions or make suggestions. Know when to put some distance between you and the play to allow the director and actors to develop the play. This project has opened new avenues of creativity for me. First, it was taking two short stories I’d written and crafting them into a script. Second was working on song lyrics which were edited, polished and put to music by Audience of One artistic director Kim Pottruff. Second, in my conversations with Kim, I shared my long-standing interest in directing, so she invited me to take on the task of assistant director. Third, once auditions were over, we found we still needed a male actor/singer for the role of the play’s antagonist. Despite my reservations and limitations, I was cast and began learning the lines I’d written (and realized the remainder of Spotswood’s advice was now irrelevant). This project has opened new avenues of creativity. Rehearsals have been underway for a few weeks now. 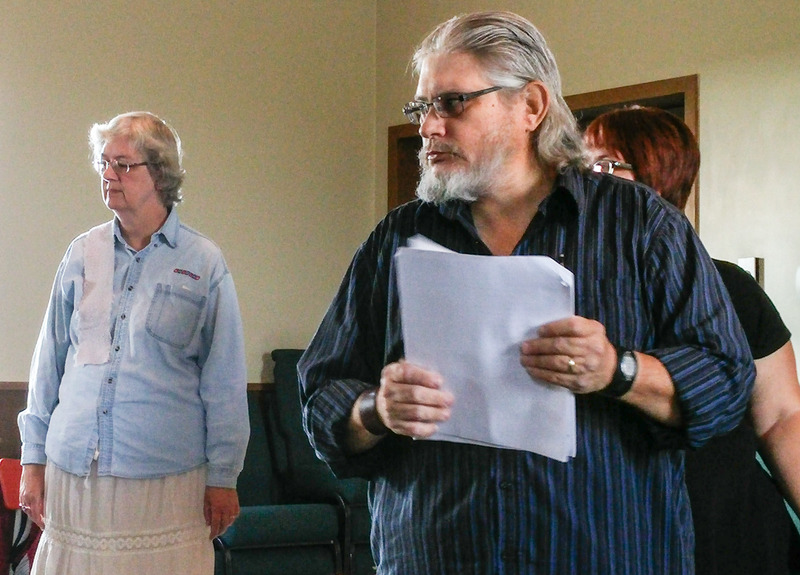 Recently the cast and musicians gathered for a Saturday rehearsal and worked through the first half of Meet You at the Manger. Up to that point, the cast was working on individual scenes or working with the musical director (who initially auditioned for a part, but whose background suited him to his current role). The “stumble through” allowed the cast to see the sum of the parts. The stumble through also demonstrated the collaborative side of workshopping a new production. The songs Kim created had initially been transcribed by a musician who is now back home in Ireland. Those transcriptions are being worked into shape by the musical director. As we put roles, music and blocking together, ideas come to the fore — from everyone: director, musicians, actors, writer. Working through one section, where we moved from one scene to the next for the first time, a blocking idea came out that brought out some humour and foreshadowing. As I’ve said in previous posts, being involved with this production is an adventure. And it’s an adventure that’s stretching my creative muscles. Yes, sometimes those creative muscles ache but I know, in the long run, they’ll be stronger for the experience.